Free shipping. Buy direct from HP. See customer reviews and comparisons for the McAfee LiveSafe - 2 Year - Service. Upgrades and savings on select products. HP recommends McAfee® LiveSafe™ as award-winning antivirus, ransomware and malware protection for all your devices with just one subscription. What is included in a McAfee® LiveSafe™ subscription? McAfee® LiveSafe™ is more than just award-winning antivirus protection. Your subscription includes a suite of services to help keep you protected online including anti-spam email filtering, firewall security, password protection, file encryption, and free customer support, all along with our 100% guarantee of viruses removed or your money back (additional terms apply). What operating systems does McAfee® LiveSafe™support? Your McAfee LiveSafe™ subscription can protect one PC or register all your devices. McAfee supports Windows PCs(10, 8.1, 8.7), iOS(9 and higher) smartphones and tablets, and Android (4.1 and higher) smartphones and tablets. License applies to personal use on supported devices you own during your subscription; see system requirements for details. Some features may require additional configuration. 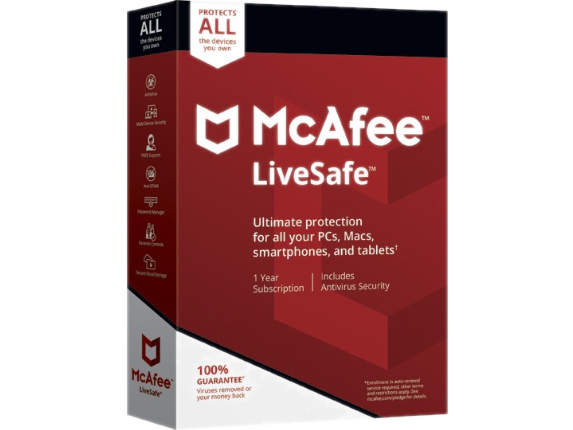 How do I protect my existing devices with McAfee® LiveSafe™?